Warning, there is a dead greenhouse creature pictured in this post! 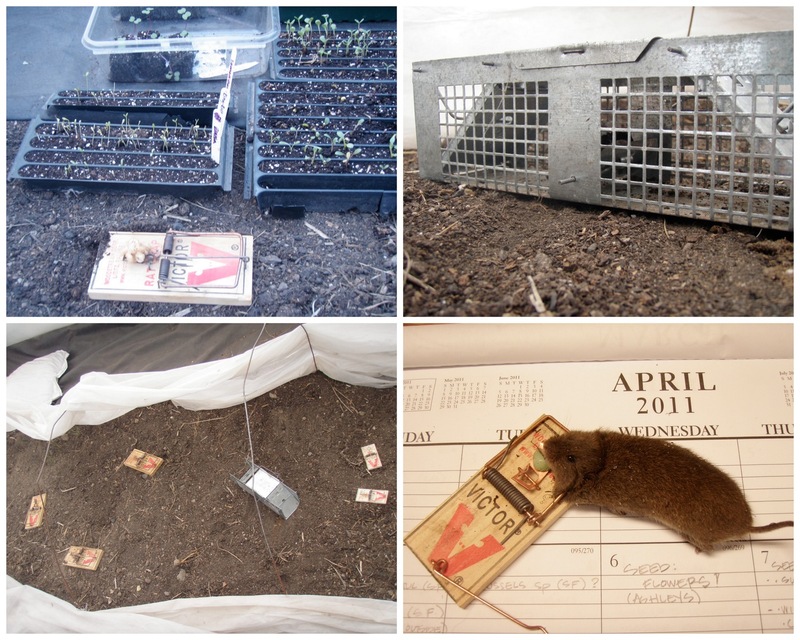 After exactly one week of trying different traps: rat traps, mouse traps, have-a-heart traps, all with different baits: peanut butter, an Airhead, a sacrificial kale seedling - the stealthy seedling swindler swiped his swan song. We had been testing each other all week. He was too small to trigger the peanut butter- baited rat trap, he was able to eat and eat and not get caught. So I set up smaller, sharper mouse traps, this time with candy. No dice. So, last night I set up the have-a-heart with a seedling inside. And wouldn't you know it, greed finally did this little bugger in. After eating the sacrificial kale seedling, and triggering - and escaping - the have-a-heart trap, the greedy rodent moved on to desert: candy! Apparently candy will not only rot your teeth, it'll break your neck, too! I have never been much for April Fools pranks, but this one seems alright.